Author's cut of the article as it appears in the May 2013 edition of New England Baseball Journal Magazine. 04/27/13: The first time I ever saw Tyler Kendrick pitch, he struck out Lou Merloni with a knuckleball. Kendrick never would have guessed this would lead to an international documentary airing on the Discovery Channel on Opening Day of the 2013 season, illustrating the science behind throwing a knuckleball. Tyler Kendrick throwing knuckleballs on the Discovery Channel. It all started October of last year. Tyler, a pitcher for the Lexington Blue Sox of the Intercity League, was a participant in the 100 Innings of Baseball annual charity game to raise money for ALS. Red Sox fan favorite, Lou Merloni, was also on hand to support the cause. The stars aligned, and Kendrick struck out Merloni with a knuckleball. Tyler, who turned 23 this April, grew up in Montague, MA, went to school in Smith Academy in Hatfield, and played with Team USA when he was 18. He then moved on to pitch for Fitchburg State University. His collegiate career was cut short when he tore his elbow and missed the next two seasons from Tommy John surgery. None of this stopped him from playing, and he�s been with the Blue Sox ever since. This March, Tyler headed to the Mass General Orthopaedic Sports Performance Center in Foxborough to have his knuckleball video analyzed for the world to see on the Discovery Channel. The segment initially ran in Canada, immediately before R.A. Dickey�s Opening Day start for the Toronto Blue Jays, before airing stateside. Filming from different angles for TV. I asked Tyler what he thought would be discovered. �I didn�t really think there was going to be that much to show. But I was wrong. 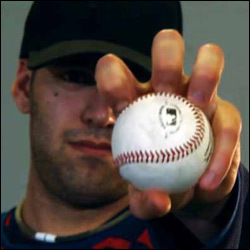 I had been told to throw half knuckleballs and half fastballs, and one thing shocked me. I have a high leg kick and a long stride. When I throw a knuckleball, it feels like my leg kick isn�t as high. But once I saw the videos, I saw I had an identical motion. The only thing that was different was that on my fastball, my arm came through a little bit faster, but you could barely tell. Watch Tyler Kendrick's knuckleball segment on the Discovery Channel. Tyler Kendrick gets a grip on the knuckleball.